To zoom in on this drawing, click on the image. 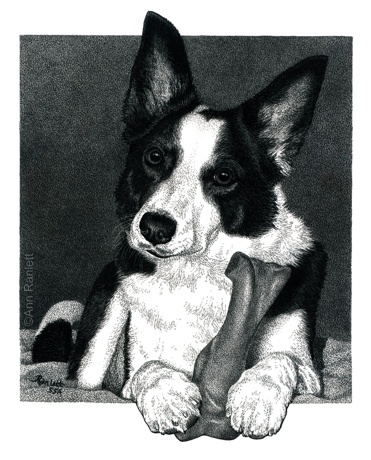 Ann’s created this portrait of her dog with the beloved “Green Bone”. Magpie’s absolute favorite toy, however, was a tennis ball. Magpie is greatly missed, she passed in 2015 at nearly 14 years old. Society of Scratchboard Artists‘ 2012 Annual Exhibition. and black wooden frame. 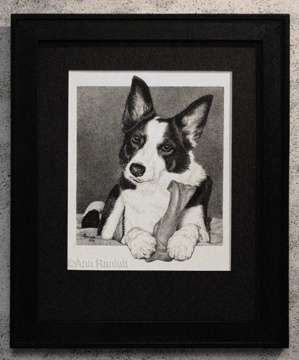 Contact Ann to purchase this drawing.